This statistic depicts the percentage of US adults with a major depressive episode in the past year in 2017, sorted by age and gender. 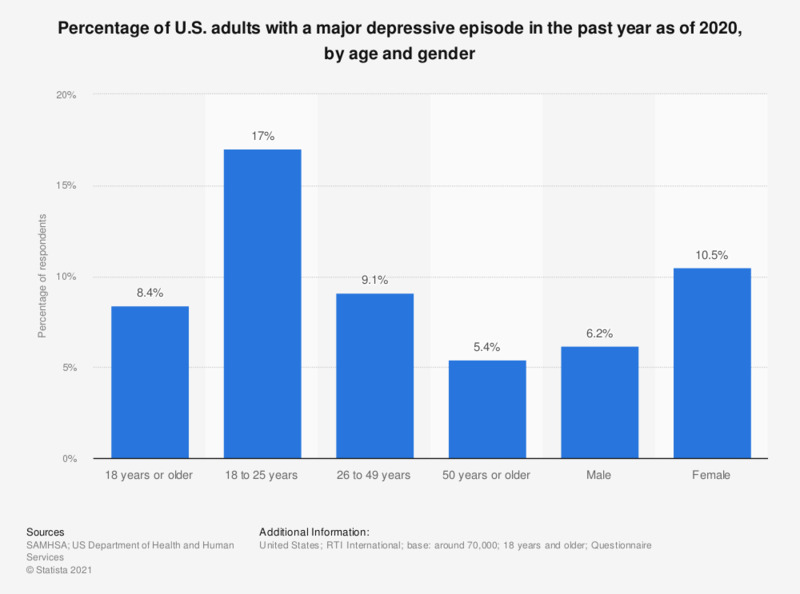 Some 13.1 percent of U.S. adults aged between 18 and 25 reported that they had a major depressive episode within the past year. In 2017, up to 7.7 percent of those between 26 to 49 years of age had a major depressive episode. Differentiating between sexes, 5.3 percent of males experienced a major episode and 8.7 percent of females. Major depressive disorder, also known as clinical depression, is a mental disorder that can occur in individuals. Common symptoms are persistently low moods, low self-esteem, and a loss of interest in normally enjoyable activities. This disorder can be caused by biological, physiological, and social inputs. Among students in the United States, almost 30 percent reported feeling sad or hopeless almost every day for two weeks or more. General practitioners and psychiatrists or psychotherapists provided the most treatment for major depressive episodes as of 2015, totaling 51 percent and 32.5 percent, respectively. Medication can also be used as treatment for depression with some 28.5 million Americans receiving prescription medication for mental health treatment in 2015. Prevention can also occur through therapy and preventive interventions.